For this generation, the most exciting topic is the Samal Bridge. And it would send off a frenzied and passionate defense of the pros and cons. Many would say it is for the betterment of the island, and many would dismiss it as it is bad for Samal and ecology. But how old is the talk, or the topic that is. Davao of the Past admin, Angkol J has stumbled on a gem. The plan to link up the island to our city is a generation old, from 1979. 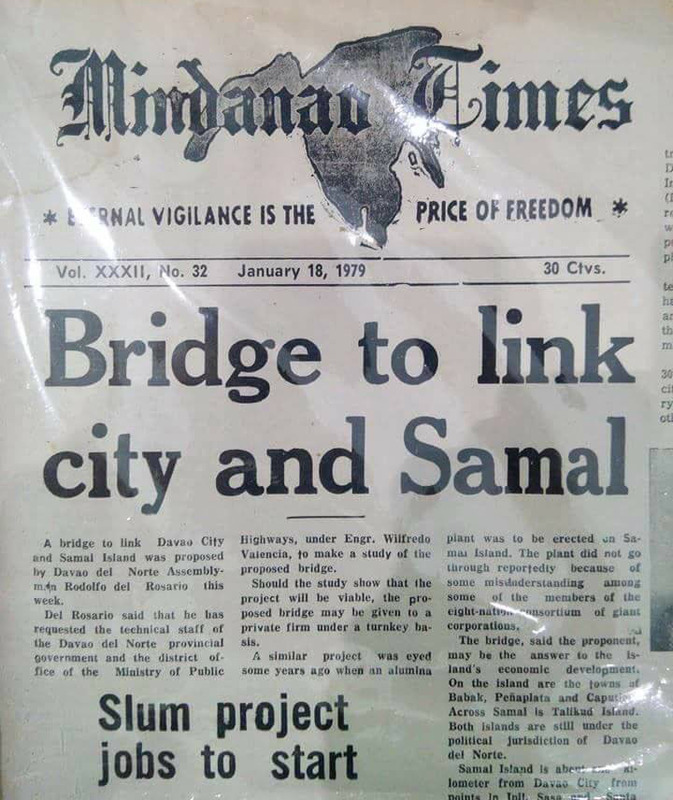 I didn’t realize how old it was until I saw the headline of Mindanao Times, the city’s venerated newspaper, and lookee here, dated January 18, 1979. Wow, that is how old the topic is, or rather the plan. And not even a post. From that time on, and a countless study after study, nothing concrete, has been poured. Pardon the pun. We either at some point decide whether to bury or build it, a pipe dream that wastes a lot of our time and resources. Posted in archives, davao, davao of the past, digital archives, old davao, repository, Uncategorized and tagged davao, davao history, davao of the past, digital archives, History, old davao, repository. Bookmark the permalink.